Where to hold a family reunion? Warm weather or cold? City or country? Beach or mountains? Travel time, cost, different preferences, backdrops for family photos—there are many choices that influence where we gather. Once we are there, Nature serves as a host that lures us outdoors. 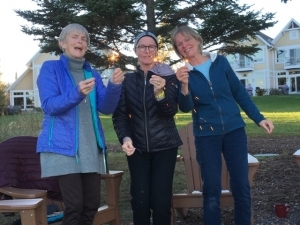 In mid-October my mother, three sisters and I held an important reunion. 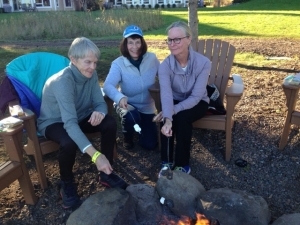 The last time just the five of us—the Brown women— were together was 30 years ago for a mother/daughters canoe trip into the Boundary Waters Canoe Area. A big clan, we have had many family reunions since then with partners, grandchildren, and great grandchildren. We have gathered for weddings, holidays, and funerals. But with just the five of us who live in four different time zones, it had been three decades. We have aged, and we have an age spread of 32 years so a canoe trip was not an option this time. 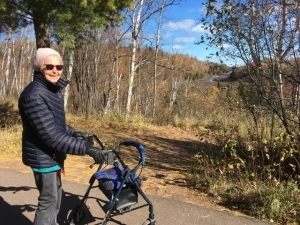 But nature is important to all of us and we all come from Minnesota so we chose to gather at a cottage on the shore of Lake Superior—a crown jewel of our home state. Lake Superior is somewhat infamous for its weather. In fact, the week before our October gathering there was a gale-force storm with 65 mph winds. A snow squall covered the ground in white our first morning in Minneapolis. However, driving north we were lucky and had sunny skies and moderate winds even though our accommodations would have kept us comfortable regardless of wind or temperature. 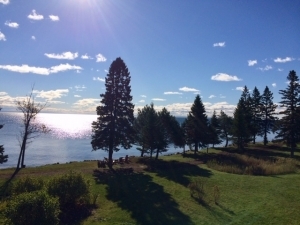 The inspiration of looking out our cottage’s window at the largest lake on the planet kept us in a place of wonder and encouraged our outdoor adventure. Mom was celebrating her 92ndbirthday and our youngest sister, Margaret, was celebrating her 60thbirthday so there was a lot of fun and frivolity. 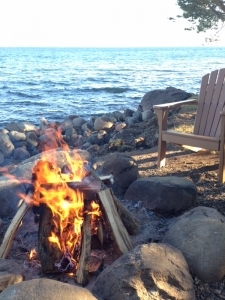 As is always the case, wandering in nature or sitting by a campfire brings forth stories and memories and an opportunity to share more deeply. We all have complex lives. It was incredible to come together for 4 days and reweave the bonds between us. 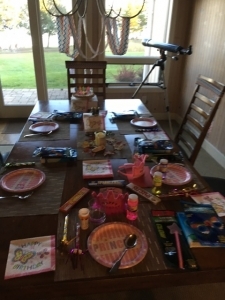 One morning we called a circle at our cottage’s dining room table and shared our respective health concerns. 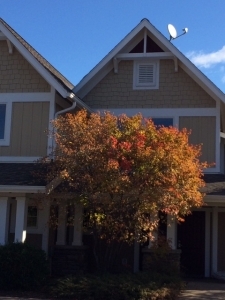 We spoke thoughtfully about the journeys of our children and grandchildren. We established a prayer list to better hold one another’s lives. As our elder, Mom spoke about her aging process and what she needs from us. I know we will work well together in the years ahead to support her. As children, Mom and Dad annually took us on a family vacation to Colorado where we saw grandparents, aunts and uncles and cousins and got to spend a week in the mountains hiking and fishing. The imprint of gathering for fun and togetherness in nature runs deep in all of us. It is part of the pattern that bonds us. I see how strongly Nature still holds us and I know that each of us has passed this love and respect on to our own children. A grove of birch trees is one living organism, connected through a powerful underground system of roots and rootlets. Like the birch trees in this late fall scene along the shore of Lake Superior, we five have a deeply connected root system. We stand apparently separate but continue to nourish one another in ways that are both visible and invisible. And that is a lot to be grateful for! I’m now living 10 miles north of Duluth Minnesota with my daughter and partner. 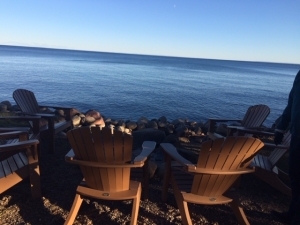 Lake Superior is an awesome body of water: With a cousin down the road and my sisters family cabins 100 miles west on Woman Lake I feel uniquely at home. I am glad to hear of this gathering of Browns. And to think back to reunions I’ve been a part of, and imagine a few for the future that might just be three of us (sister, me, parent). Thank you Ann. What a lovely story, Ann! You Brown women inspire me to think about doing this with my children. Oh, what a marvelous thing to have done; and on the shores of the lake with which you have such history and relationship. I admit to sister envy, and that is all I will say here about that! Such a great gift to have given your mom. Thank you for sharing the journey. What a glorious week! It was an honor to stand at your back, send you off, welcome you home. I love how you worked with all the physical challenges and different levels of fitness and made Nature really one of the family, not just a backdrop for the family. What a beautiful group of women. I’m so pleased you had this time together in such a perfect setting. I love how you invited nature to be your home for this gathering — and also that you “called a circle” while together. What a helpful image for how families (or anyone) can have intentional conversation. Thank you for sharing this story. I’m so happy you could have this gathering, Ann, and also add a reunion with The Lake. Beautiful pictures and beautiful story – which is great to hear during a time of year when some families struggle with their get-togethers. Thanks for sharing this! What a gift!! For all – and to have your Mom present as well – double gift. 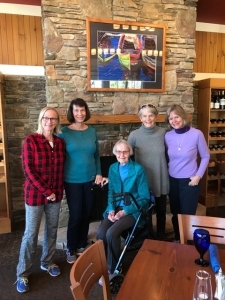 Having six sisters I know how complicated and also how wonderful it is to get together from such different paths in life to reconnect with the part of life that you will always share together. And with the gathering, be able to be real about where each is in life and to ask for what is needed and offer what each can. This warmed my heart, Ann, so thanks for sharing. I loved all the photos and loved how you weaved the great outdoors into your time together (but of course you did ;-))! I so love these photos, Ann! Thank you. 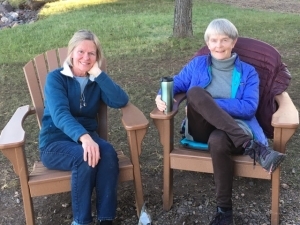 Thank you for sharing how and why you re-connect deeply with your mom and sisters, Anne! Perfect timing, as many of us will visit with family in the coming months. We differ in many ways, and your recounting gives me some ideas of how to better connect with them. Thanksgiving blessings to you and yours. Your time there, Ann, sounds wonderful, and your idea for the next trip home sounds equally worthwhile, Deb. The Minnesota connection is strong. Might as well give in! I will never forget the North shore beauty loved every second. Especially laughing and sharing with my fam. Beautifully said and done, Annie. Love you! So lucky all of you! So very blessed. Beautiful story of a strong family of women! Great legacy out on the land too. Thank you so much. It was healing for me to read today. Thank you for the good gift of this story! I appreciate you, dear TreeWoman, using the metaphor of the birch trees to acknowledge your connection to your sisters and mother. Beautiful story, reunion, and how you support each other and your mother and families moving forward. Much love. 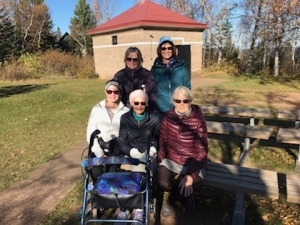 Ann, Thank you for sharing your story of reunion with your mom and sisters on the amazing Lake Superior coast. 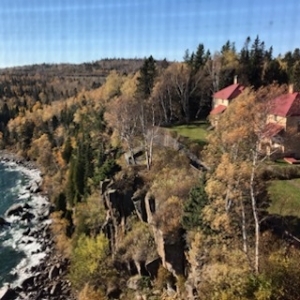 I ended one Boundary Waters canoe trip at a B & B in Lake Superior. Laughing when I walked in still muddy and funky from my paddle trip to a totally white room! I love the photos of you and your mom and sisters! Your combined spirit shines through! So happy you all have each other and intentionally (not surprising) speak about how to be present for each other. May you all be well, happy, and strong in your circle of clear love for one another.